The fan who shined a laser on Patriots quarterback Tom Brady during the AFC Championship Game has already been banned from Arrowhead Stadium for life but will now face a disorderly conduct charge that is punishable by up to a year in jail or a fine up to $1,000. Good move by the Chiefs. There is no room for this kind of behavior in sports. Distracting anyone especially in today’s game could be catastrophic with the speed at which the game is played. Fans need to pay the price if they are going to act like idiots and it is great to see teams stepping up and protecting players from opposing teams. The fan has been permanently banned from Arrowhead Stadium. Now I’m not calling for the guillotine a public stoning or this man to be burned at the stake, but maybe 30 days behind bars will send a message that this will not be tolerated in society. This wasn’t the work of some mischievous teenager who thought it was a good idea to shine a laser in Tom Brady’s eye and didn’t think it through. This is the work of a 64-year-old man who clearly had it planned out well before the game If he needs to be the example made to end this in sports, so be it. Here's what our photographer shot at Sunday's AFC Title game in KC. 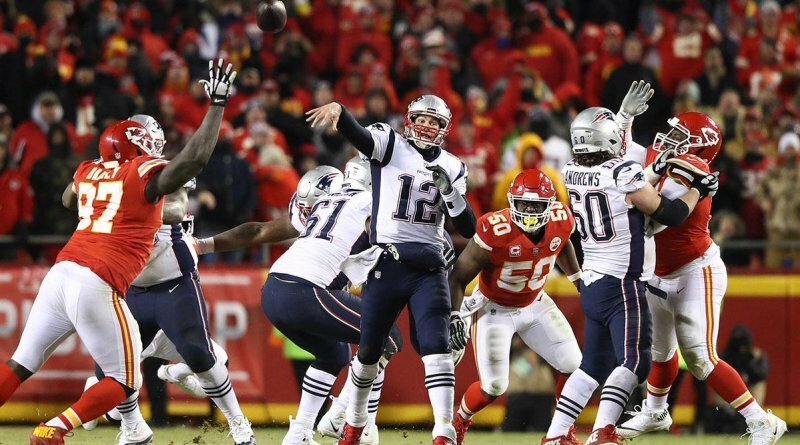 #Patriots QB Tom Brady targeted by a green laser in 4th against the #Chiefs. Bill Belichick was asked about it.